Tag line: "There are angels on the streets of Berlin"
Life certainly isn't without its problems. Aside from the everyday hassles of traffic jams and mounting bills, there are the more intense issues we must occasionally deal with: relationships, illnesses and the very prospect of our own mortality. Like many people, I try, on occasion, to escape these problems, and my particular avenue to freedom happens to be the cinema. But for Damiel (Bruno Ganz), an Angel sent to earth to observe mankind in Wim Wenders’ Wings of Desire, human life, whether it be filled with pain or pleasure, is beautiful, and he longs to experience it. While we’re busy trying to dodge life, Damiel is looking for a way in. He and his partner, Cassiel (Otto Sander), spend their days and nights watching over the citizens of Berlin. As an Angel, Damiel is neither seen nor heard, which allows him to move freely throughout the city, intermingling with others as he listens in on their thoughts and observes their actions. One day, Damiel visits the circus, where he spots a tightrope walker named Marion (Solveig Dommartin). He falls in love with her, and decides to do what very few Angels before him have done; become human. Even though such a change will cost him eternal life, Damiel believes the potential joys are well worth the sacrifice. 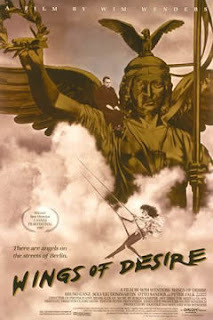 Wings of Desire looks at humanity from the point of view of an outsider, someone who knows our ways and customs only through observation, and though it means the end of life everlasting for him, we can identify with Damiel's desires to become mortal. Much of the credit for this must be given to Bruno Ganz, who brings a child-like innocence to Damiel, a being who sees beauty where others might find pain. In a key scene, as he and Cassiel are sitting around comparing notes at the end of the day, Damiel finally reveals his deepest wishes to his partner. “To be excited not only by the mind”, he says with a smile, “but at last by a meal” He longs to know what it’s like to feel, to smell, to “guess without always knowing”. Coupled with Ganz’s performance is Wenders’ exploration of the city of Berlin, presented in a wholly detached manner, as if we, too, were observing it from the outside. Made at a time when the Berlin Wall was still standing, Wings of Desire brings us to this monument of political division on a number of occasions, and while the citizens of Berlin are kept on either side of it, Damiel and his kind travel freely through both sections. In fact, there at times we're not sure which side of the wall he's on, and ultimately it doesn't even matter. As Damiel and Cassiel have learned, people on both sides are basically the same. Through these characters, in this city, Wenders has given us the opportunity to detach ourselves from the world we know, to exist on the outside instead of within. We too are observing, and all at once can see why Damiel finds the world so appealing.